A craniotomy is a surgical operation in which part of the skull, called a bone flap, is removed in order to access the brain. Craniotomies are necessary for many types of surgery including lesions, Traumatic Brain Injury (TBI) and the implantation of deep brain stimulators for the treatment of Parkinson’s, epilepsy and cerebellar tremor. Human craniotomy is usually performed under general anesthesia but can be also done with the patient awake using a local anaesthetic and generally does not involve significant discomfort for the patient. In general, a craniotomy will be preceded by an MRI scan which provides a picture of the brain that the surgeon uses to plan the precise location for bone removal and the appropriate angle of access to the relevant brain areas. The amount of skull that needs to be removed depends to a large extent on the type of surgery being performed. Most small holes heal with no difficulty. 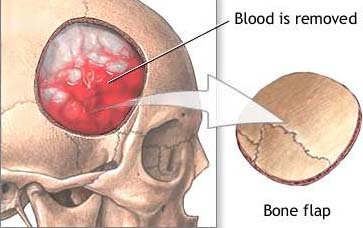 In removal of larger parts of the skull, the removed skull is generally retained and then refitted. It is held in place temporarily with metal plates and rather quickly reintegrates with the intact part of the skull, at which point the metal plates are removed. Craniotomy is distinguished from craniectomy, in which the skull flap is not replaced, and from trepanation, which is performed voluntarily without medical necessity.